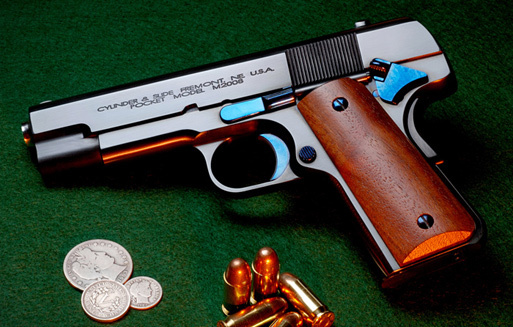 Thank you for your interest in my 1911 style pocket model. I have always admired John Browning’s pocket model pistols as they were designed to be a true pocket pistol. All of the exterior corners and edges were gracefully rounded to allow an easy draw from the pocket. At the time of their introduction most men carried a handgun to protect themselves and their family. Automobiles were a new invention and the horse drawn carriage was the standard method of transportation. I have always wanted to produce a 45 ACP pocket model style pistol and my love of the 1911 pistol design was a natural combination. The greatest problems to overcome were making a slide and frame that would conceal the hammer and the internal extractor that the 1911 was designed with. The advent of the external extractor for the 1911 pistol solved the extractor problem but the manufacture of the slide and frame was still the problem. Welding additional pieces of metal on the slide and frame and re-machining them was not a good option as the welding would ruin the heat treatment in the slide and frame. Re-heat treating the parts was not an economical option. It suddenly came to me that the additional metal parts could be silver soldered on without destroying the heat treatment in the slide and frame and I have one of the best silver solder experts working with me in the shop, Chris Hagemann. I approached Chris about the project and he thought that he could solder the parts together without any problems. I contacted Gary Smith at Caspian Arms about the project and he was very enthusiastic about helping me. I purchased one of their commander size external extractor slides with the rear contour of the slide left un-machined along with an officer’s model size frame. I felt that the commander slide and the officer’s model size frame would give the proper proportions to the pistol to mimic the beautiful proportions of the original pocket model pistols. And as they say “the rest of history”, Gary Smith looked at the prototype pistol that I built during the 2006 Shot Show and fell in love. He convinced the powers that be at Caspian Arms that one of their frame molds could be modified to include the rear projection to conceal the hammer and that their wonderfully talented machinists could machine the frame correctly and machine a slide with the rear extension to conceal the hammer from one of their 1911 government slide forgings. I want to thank those guys for having the creative talent and desire to program and tool those CNC machines to produce the slide and frame for me. The 45 ACP pocket model pistol would not be a reality without the commitment of Caspian Arms and the skill and dedication of their machinists. My pocket model is manufactured from the finest parts available. I use Cylinder & Slide billet alloy steel hammers, sears, and disconnectors. The barrel is custom manufactured to my specifications by Bill Jarvis. The pistol is furnished with 2 Cylinder & Slide Extreme Duty 6 Round Magazines. The springs are manufactured by W. C. Wolff. You may purchase the Standard Model or have a Pocket Model customized to your personal specifications. Please understand that we are custom building just one Pocket Model at a time so you will have to be patient for the delivery of your pistol. We will only manufacture 50 pocket models per year so availability will be limited. To order your Pocket Model please call us at 800-448-1713. I will be happy to personally assist you in placing your order for your Pocket Model. President, Cylinder & Slide Inc.